Don’t think you are a photographer just because you use Instagram. It’s one of those things people say to make things that aren’t quite so clear, well, clear. As if imposing boundaries on the boundless adds certainty. As if the world were black and white. As if everything needs its own place, its cubby, its designated compartment. This way, the world makes sense. Which does help explain some of life’s great mysteries. But not completely. Take intellectual property, for example. When I tell people I write about intellectual property law, their eyes glaze over, they politely nod and smile, and say, “Cool!” Cool. Cool said in the way I’d say cool if someone told me their hair stayed curly much longer today than yesterday, all thanks to this new hairspray they’re trying because it’s personally endorsed by The Hair Queen of Hairdonia. But it’s OK. I would have said something similar just a year or two ago. I mean, I never once thought, “Gosh, when I grow up I want to become a journalist and write about patents and copyrights! Yayayayaya!” After all, intellectual property on its surface is this weird, enigmatic thing. It’s intimidating and scary. It’s amorphous and complex. We ordinary humans take intellectual property and say: I am putting you in my amorphous and complex cabinet, only to be opened on desperate occasions, like that time I ran out of sugar so I finally opened that hard-to-reach cabinet over the fridge to check if it happened to have sugar because risking food poisoning made more sense than putting on five layers to go outside. So, let me get this straight. Intellectual property is property of the intellectual kind? Obviously, Merriam and Webster stayed home from school the day they went over how you’re not supposed to use the words you’re defining when you’re defining them. But all is not lost. Let’s break it down, Will Smith styles. OK, I can’t explain IP in rap. Let’s break it down. Karen styles. With this, Congress said: Let there be the patent system! People like to create almost as much as people like to freeload. The patent protects the innovators from the moochers. It also gives people an incentive to create stuff by granting them the exclusive use of their inventions for a limited time. In the US, it’s 20 years. So, for those 20 years, no one can use someone else’s patented invention, unauthorized, and profit from it. After the patent expires, the findings of that invention enter public domain, and anyone can use them to innovate. Basically, it’s one generation’s gift to the next. Simple enough, right? This makes intellectual property less amorphous. There are now cubbies. Intellectual property is the invention. The patent protects it. Anyone who profits from the invention without permission is infringing the patent. The very smartphone you’re reading this on is likely covered by thousands of them. So, let’s say someone takes an iPhone, replicates it and passes it off as a new product. That’s infringement. But let’s say someone sells a smartphone covered by its own set of patents that cover its own set of features similar to a set of features also covered by an entirely different set of patents for the iPhone. Other than the subject of ongoing major litigation, it’s also the gray area. And the grays are the really interesting part. The grays defy a simple definition. Because one person’s definition of what constitutes infringement may not mesh with your definition of what constitutes infringement. These various, often conflicting definitions of infringement are what’s plaguing Googlebooks, SOPA/PIPA and, many would argue, the progress of science and the arts. So, while definitions help us understand things better, they don’t cover everything. Some things don’t belong in neat little cubbies. Maybe they belong in more than one. Even worse than an incomplete definition is a misguided one, like when people define an enigmatic concept by using the wrong words (at least Merriam and Webster used the right ones). This is what’s happening with the Instagram. It’s an attempt to define a photographer by the tool she uses. Which is fine, if you’re part of that “REAL photographers use silver on a copper plate with their bare hands, just like Daguerre did in 1839!” set. But my definition of what makes a photographer is not their definition of what makes a photographer. Because in my definition, a photographer isn’t defined by the camera she uses but by how she uses it. In the beginning, there was the camera. Scientists, mathematicians and astronomers used it for scientific, mathematical, astronomyish purposes. The artists, as artists tend to do, took that contraption and made things look cool. And I’m not talking Hair Queen of Hairdonia cool; I’m talking Gladwell wrote a bunch of interesting books connecting seemingly unrelated concepts, got them illustrated and repackaged into a boxed (My birthday’s coming up!) set cool. But these things didn’t look cool because of the camera. Had the camera not been invented, I’m sure these artists would have come up with some other cool ways to express themselves. Like, I don’t know, paint or sing or string together household objects emulating sea creatures and hang them from the ceiling. Or something. Luckily, Ansel Adams didn’t have to resort to bioluminescent installations (Notably, he was a musician in his youth. A world sans camera might have led him to pursue music instead), because the commercially made camera made it possible for more people to do with it whatever they wanted to do. Just like smaller film cameras did, the lower priced ones did, the SLR, the DSLR, the point and shoot, and the camera phones did (and do). What hasn’t changed is what makes a good picture. It’s easy to say that a photographer is someone who knows how to use a DSLR or develop his own film, because they come with tangible measurements. The photographer, this suggests, knows how to let in a little more light, speed up the shutter speed and adjust this or that to produce the desired result. There’s a bit of math, craft, science, mechanics involved. But a great part of creativity, and that’s what I’m really talking about here, is intuitive. There’s curiosity, the feeling, the story, the eye, the connection to the reader, the viewer, the listener. And communicating that doesn’t require supercalifragilistic lenses. I’ve seen people take terrible pictures with awesome cameras. People get enamored with the intricacies of things, as if the more buttons and complications something has, the more impressive their abilities. I liken it to a writer adding fluff to a sentence, as if the longer it is and the bigger the words, the better delivered the message. But see, all that is nothing without the idea. Once you reach a certain level of competence, what sets you apart is the story you tell. A writer with perfect grammar, a MacBook and nothing to say will always be trumped by the slightly flawed writer with a notepad and insight. A photographer with a great camera but no perspective produces a nice picture that says nothing. In this ever evolving world, where a picture, a song, a movie can be produced and shared in ways only previously imagined, the challenge is in producing a quality product when there are fewer places to hide. Of increasing importance is the intangible, the thing that’s hard to define. It’s what will always set a work of art apart from a work of technical brilliance. I promised myself I wouldn’t. I even gave myself a pep talk right before. But faced with the temptation, I could only resist for a lousy two minutes. And half of that I spent fumbling for my wallet. Hi. I’m Karen and I’m a bookaholic. All things considered, it’s not THAT bad. I mean, compared to other addictions, the worst that could happen is that I overload my brain. Or be buried alive by an avalanche of books once perched atop a poorly secured wall shelf because – who are we kidding? – I have no room in my room for grand bookcases. So, there I was, walking into Barnes & Noble, one of my favorite post-work stops when I still have brainpower to spare, thinking I’d pop in, flip through a magazine or a book or whatever, and pop right back out. I noticed it was 6:20, a mere 40 minutes before book readings there usually happen. I casually Googled who might be there that night (because going up four flights of escalators is too much to ask of someone on the ground floor), and, lo and behold, it was Maira Kalman – super illustrator and artist of all the things. Clearly, there were external forces at work here. I had to buy her new book. My bookaholism is only exacerbated by my work’s proximity to this glorious, four-story Barnes & Noble. I’m there so often I know the employees by name. There’s Jake with the peg leg, Roman the this-is-a-no-sitting-on-the-floor-zone enforcer, Sandra with the yellow high-heeled boots, Meg the angry Nook teller and Samir the Magnificent (Electronic Cataloguer). “Welcome, my dear Karen,” they said. I took my usual aisle seat diagonal to the podium, perfectly positioned to either give the author my signature come-hither stare not unlike a groupie at a Best Of Julie Andrews As Maria Von Trapp Played By Julie Andrews concert or sneak out as unnoticed as one can be in a completely open space where you can see everything and everyone. 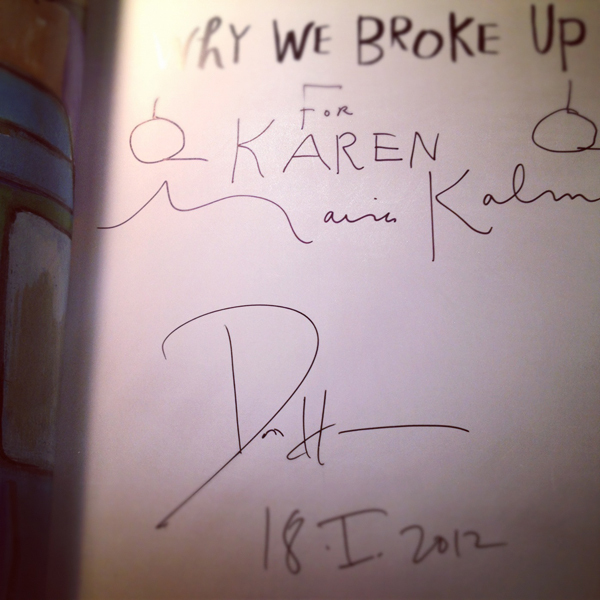 Kalman and Daniel Handler (aka Lemony Snicket) took the stage. Using a photo of an empty, messy desk, they described how Einstein used Kalman as his muse for the theory of relativity (M for Maira! C for Calman!). It was the kind of conversation best experienced by a third as a spectator, chin on palms, carpals pressed together, grinning shamelessly. They were witty. Too witty. So witty that by the time I got my book signed, all I could say was, “Hello. Hi.” Brilliant. Once on the subway, I encountered an all too familiar conundrum: read the shiny, new book or the one I’ve been working on for… forever? This got me thinking of all the times I’d chosen the shiny, new book over the perfectly great current one. It’s one of the major downfalls of bookaholism. Often, the new becomes the old until the old is once again new, and the never-new is never-read. I’d had enough. With Rafiki-like conviction, I declared to my fellow commuters and the pantsless crooner who, with his rendition of Boyz II Men’s “I’ll Make Love to You,” went from a Grade A creeper to the stuff viral YouTube sensations are made of: IT IS TIME. So, here it is. Project Read One Book At A Time, Dummy. In it, I’ve listed all the books I’ve started in the last year and have yet to complete and hope to complete in 2012. Do feel free to share reading tips of your own or to scold me for no reason in particular. Do not, however, take this as an invitation to scold me for my life, er, book choices, for I will return the favor by scrutinizing your choice of hats. I’m aware this could get frustrating. I’m also aware I’ll very likely suffer a meltdown involving a book, a match and a vat of red ink. But I’ve never been one to back down from a worthy challenge. I am, after all, Winner and Champion of Spontaneous Spelling Bees With Scant Participation. But maybe this is much bigger than that. Maybe this is for all the bookaholics out there who never had someone tell them that good books are meant to be finished. That that shiny, new one will still be there a month from now. So please, please buy groceries before you go to Barnes & Noble. Because I’m pretty damn sure you have that on your Kindle. Yes. This is for you.